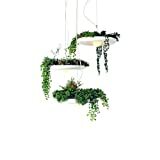 Recreate the legendary Hanging Gardens of Babylon, one of the Seven Wonders of the Ancient World, in a significantly smaller scale inside your home when you hang these cool new Babylon Garden Light / Planters from designer Ryan Taylor. 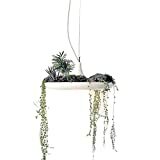 These unique hanging pendant light fixtures are surrounded by planters that are deep enough to safely grow herbs and other small plants up and out of the way. Hmm, I suggest planting Venus Fly Traps to gobble up all those pesky flying insects that are drawn to the light.